Spawn Only on top of a Glacier found in the Twilight Forest. The Penguin is a mob found only atop Glaciers in the Twilight Forest. They are the Twilight Forest equivalent of the overworld Chicken and can be turned into Chickens with Transformation Powder. However, they have 250% of the health of the Chicken, and Penguins do not drop Raw Chicken or any other food item, unlike Chickens. Likewise, a Chicken can be transformed into a Penguin with Transformation Powder. They spawn in large colonies atop a Glacier; although a Glacier is a fairly rare biome in the Forest, Penguins can be found in large and profuse quantities atop a Glacier. Penguins are approximately the size of a Chicken, but have a different and more blocky mesh. Instead of walking, they waddle, and due to texturing and meshing anomalies, their feet appear to rotate on a sort of axle that causes the front part of their foot to rotate upwards into the body of the Penguin when they are stepping/waddling forward. Penguins also use the same flapping animation that a Chicken uses. However, while the wings of a Chicken appear to disconnect from their body when flapping, the wings of Penguins are longer. As such, Penguins' wings do not disconnect when they are flapping their wings. As with Chickens, Penguins will flap their wings and descend slowly from high elevations. 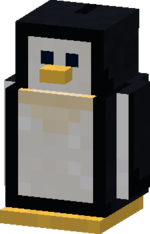 This means that Penguins cannot take fall damage and do not take damage from many other outside sources, as Glaciers are fairly peaceful locations due to the absence of anything but ice as far as the eye can see. Penguins can be bred to create baby Penguins. Whereas Chickens now require seeds to breed, Penguins currently require raw fish to enter "love mode" and breed. As such, it can be confusing for the player as to whether or not Penguins can breed. When in a water source tile with no empty air blocks above them and no routes to escape to from the side, Penguins will still attempt to swim up. If there is a transparent block above them, they will swim upwards and keep their head inside the transparent block, causing them to not take suffocation damage. If the block above them is opaque, then they will still try to swim upwards, causing suffocation damage. This page was last modified on 17 April 2019, at 06:24.